i’ve been working in this industry for about a year and a half since coming over. my cousin got me this job. he said it was going to be a lot of work. but they don’t ask no questions and i get ten an hour. i take things off the truck and deliver them. 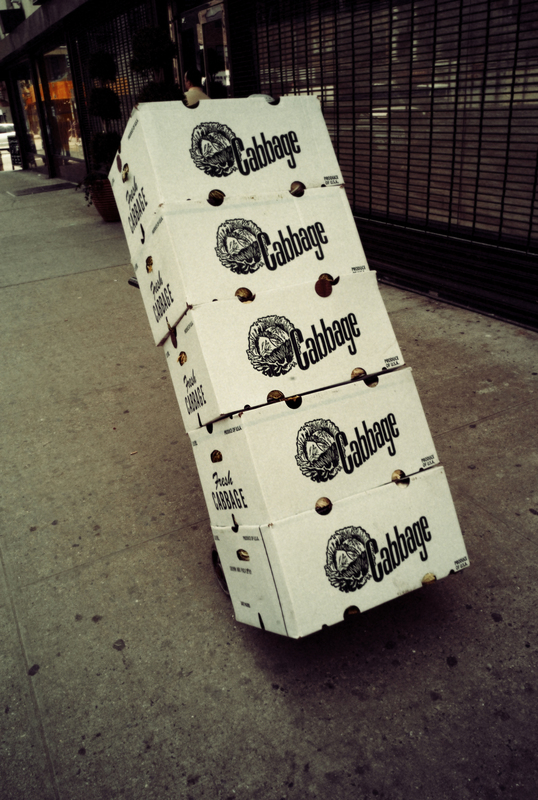 if i had to say i noticed one consistent thing about this city is how much cabbage we deliver. chinese restaurants. delis. bodegas. pizza joints. the movie theaters. the starbucks. the duane reade. the target. the zoo. everywhere. all we did for twelve hours straight was delivering cabbage from one place to another. you know boxes and boxes of cabbages. the amount just doesn’t make too much sense to me. maybe except for some of those people that eat pickled cabbage all the time, but that doesn’t equal out with the amount of cabbage we are delivering. my boss tells me we delivered about three million pounds of cabbage in the last six months. and that’s just here in manhattan. he said if gas were cheaper, we’d be delivering at least three times that easy. Tags: 28mm, commute, everyday life, imagine, leica, let's hope there's not a revolution, lower east side, manhattan, NYC, photography, street, Street Photography, voigtlander, who really eats cabbage? this narrative is wonderful, thanks for the stories and photos!